Our monthly luncheons are open to ALL members of the general public. However, club membership is reserved for registered Republican voters only. Anyone interested in joining should attend a regular monthly meeting and request a membership application form ( See Carol Lucas). You may also fill out the on-line application below, and send your dues by mail. Annual membership dues are $25.00. They are collected at the December or January meeting each year. 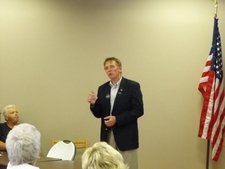 Dues are used to support candidates, fund voter registration drives and public education. We ALWAYS welcome your donations! Freedom is not free, it MUST be defended. Held on the second Tuesday of the month. 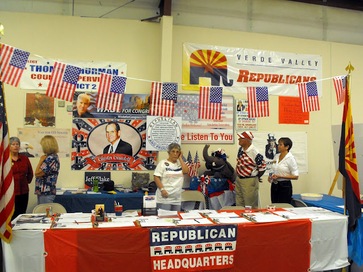 Club members manning our booth at the annual Verde Valley Fair.